Big time health food on the platter here: Orange cauliflower with power folate, cancer fighters, fiber, vitamin C and many other beneficial beauties. Brussel sprouts, too, sport essentials like iron for hemoglobin, and the sautéed mustard greens give it all a little punch. Sop this up with Naan and Indian Curry for a warm and healthy vegetarian meal. Use a steamer basket in a pan of boiling water to steam the Brussel sprouts and cauliflower for about five minutes until just tender. 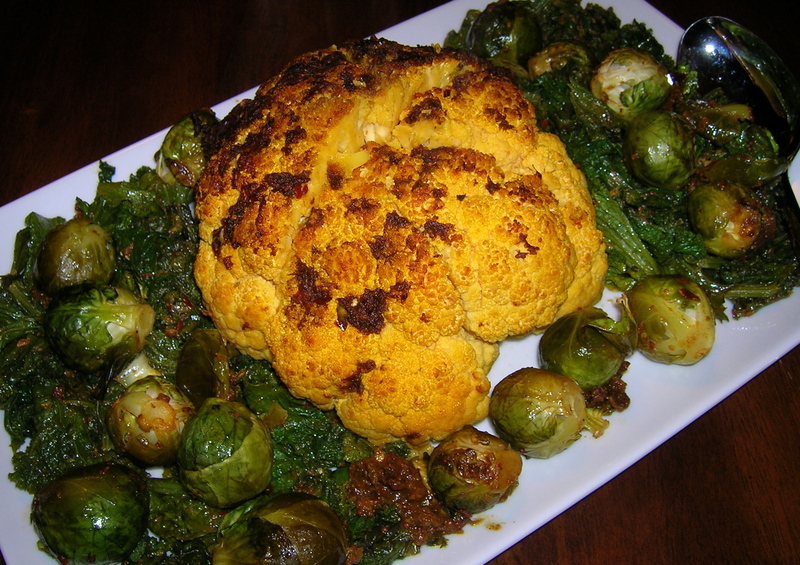 Place the cauliflower into a baking pan and spread a coating of the Indian Curry over the top. In a bowl, mix the Brussel sprouts with a large spoonful of the curry and place mixture into baking dish with cauliflower. Bake at 375 degrees for 30 minutes or until tender. Once the Brussel sprouts and cauliflower are tender, saute the mustard greens with a little olive oil and salt and pepper to taste. Plate the veggies and serve with Naan (Indian flatbread) and more curry dip. Coat the saute pan with half of the oil, and saute the onion until it begins to brown. Add chopped ginger and garlic and cook until they release their flavor. Next add the cumin seeds and mustard seeds. You want to make sure there is enough oil in the pan to coat the spices. Add the rest of the spices one after the other and stir them around in the pan until you hear the mustard seeds popping. Squeeze the lime juice into the mixture and then the rest of the oil. Turn off the heat, and remove the sauce from pan into a bowl. You don’t want anything to burn! Hi just came across your recipe; I have tried variations of this recipe; loved the idea of brussel sprouts in the presentation.